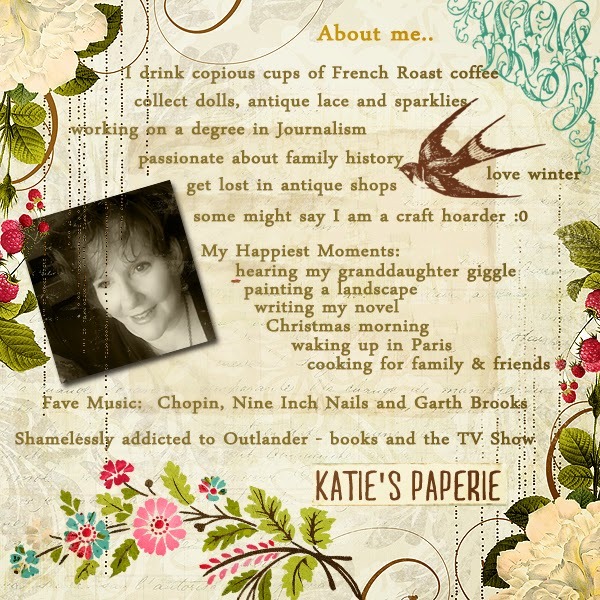 MyMemories Blog: Today's Daily Designer....Katie's Paperie! It is a pleasure to meet you! My name is Katie McClellan and my design shop is Katie’s Paperie. I have been designing since 2004 and it’s hard to believe that 10 years have gone by. My style is heritage and vintage – usually with a lot of romantic elements and feel to the kits. I love creating historical kits. I do a lot of genealogy work and building of family history pages. A bit about me – I am a passionate Francophile and love being in France and most especially, Paris. I am my best self when I am there – confident, creative and impossibly happy. My dream would be to live in France before I grow old – but then leaving my family here keeps me from jumping on that dream. So, I work to create a bit of Parisian comfort in my home and my life. I recently learned that my corporate job is to be eliminated in December. This has opened an interesting window for me – and I have decided to take at least a year off to finish my two novels, donate my time to the elderly and just be in the moment as much as I can. I will work on adding to my store here, designing accessories, journals and hopefully picking up more freelance personal historian work as well. What I love most about digital design is the moment that an idea materializes on the screen – the perfect blending of a pattern or when an element comes out so realistic. It’s like magic. I love too, the idea that my designs become part of your creative vision – and we as a community are so richly connected through this process. My hobbies include painting - I am a watercolour artist, creating art journals and books, photography and writing. Storytelling, whether in art or words, is my true north. I must admit that I am not all that social media savvy. I have only just recently joined Twitter – @OnePaleRose. 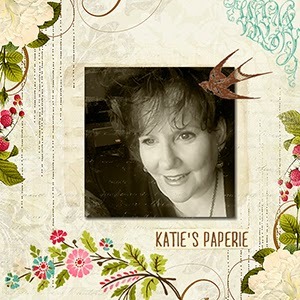 My FB page is https://www.facebook.com/pages/Katies-Paperie/. I very much appreciate MyMemories for providing me an opportunity to introduce myself and my art to all of you – and for hosting my work . I have a 40% sale on for the weekend - stop by and pick a pretty to take home! Enjoy 40% off Katie's Paperie in the MyMemories Design Shop!